Can I complete the whole of Round 9 of ABC Wednesday based on our four week stay in South Africa in February? Click on the photos to enlarge. 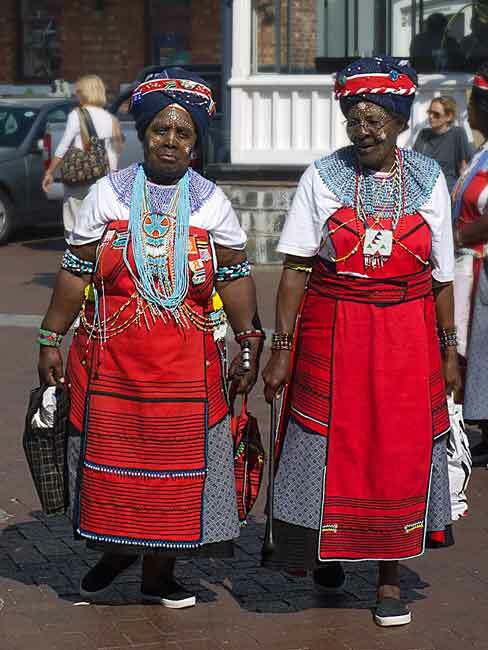 My first V from Cape Town is the Victoria and Alfred Waterfront, a very colourful place as you can see from the ladies who had been singing with their choir. And it is Victoria and Alfred, not Victoria and Albert. Construction on the harbour was begun by Prince Alfred in 1860, the first basin being named after him and the second after his mother, Queen Victoria. It was redeveloped during the 1990s and today, the V&A is a vibrant shopping and leisure centre that is busy every day of the week, especially when the cruise ships call. Many of its historic buildings still remain, including the Clock Tower on the right, built in 1883. My next V is for vines and vineyards for which South Africa is justly famous with wine production concentrated around Cape Town. The country’s history of wine making dates back to 1659 when the produce of Constantia was considered one of the great wines of the world. The Wine Route follows the R62 past the vineyards of Wellington, Tulbagh, Worcester, Robertson and the Klein Karoo, making it one of the longest wine routes in the world. 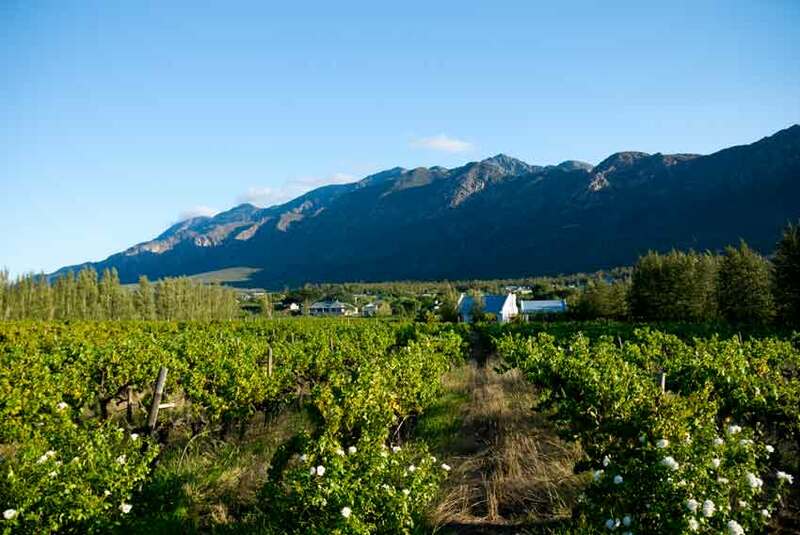 The photo of a vineyard on the left was taken in Montagu at the western end of the Wine Route, an area noted for Muscatel, the sweet, full rounded wine with rich fruit flavours that is drunk on crushed ice or at room temperature. But the V I can’t ignore, no matter how hard I try, is the vuvuzela, the instrument that provided the soundtrack for the football World Cup in 2010. 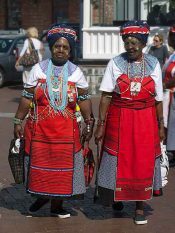 The plastic horns blown by fans at the games have their origin in the kudu horn used to summon distant villagers to attend community gatherings. 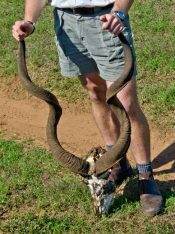 On the right is our guide at Schotia with a kudu antelope skull about to demonstrate how the leathery outer simply slides off the boney inner horn. To me, the constant vuvuzela wail at the matches sounded like a demented bluebottle trapped in a lampshade. You can try out the noise here if you wish, or tune to Vuvuzela FM for a vuvu voluntary. But for the absolute last word on the World Cup and the vuvuzela, below is the Vuvuzela Song by Dave Henson in which Prince Albert of Saxe-Coburg and Gotha does get a mention, with apologies to Rihanna. Great post for V. I enjoyed your photography and narrative very much! Fascinating how international competition can bring a noisy instrument to the forefront of the language. Of course you could not ignore the vuvuzela! 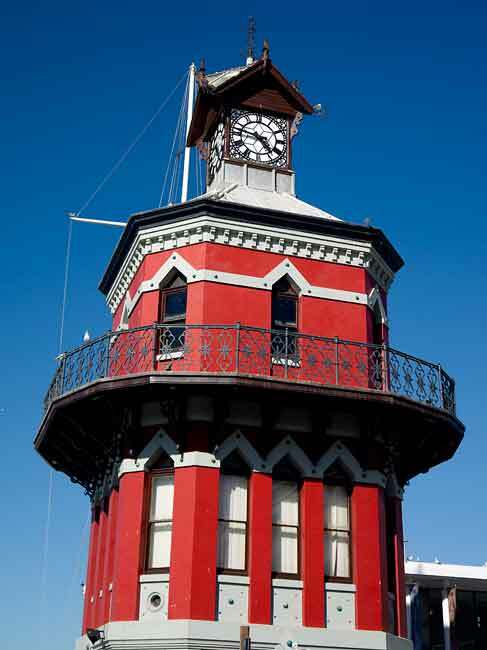 I had heard of the Victoria and Alfred Waterfront and often wondered if that was a misnomer that just stuck. Another unique post from your travels – so adventurous compared to my Vanilla Slice! lol! The diversity of ABC Wednesday eh? What a fantastic take on the theme and great post, of course I watched the World Cup! The vuvuzela is actually an unmentionable part of a lady’s anatomy and should only be blown on special occasions or when the neighbours are out at the supermarket. This is a fun post. I think I’d rather hear the kudu horn than the vuvuzela.